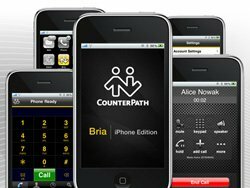 CounterPath has released the Bria iPhone Edition for Apple’s iPhone, iPad and iPod Touch. Bria iPhone Edition is a VoIP softphone that works over both 3G and Wi-Fi networks. Bria iPhone Edition integrates with other CounterPath desktop and convergence solutions, as well as with enterprise and carrier infrastructure equipment from vendors such as Alcatel-Lucent, Ericsson, BroadSoft, Metaswitch, Avaya, Cisco and NEC. Bria iPhone Edition also supports Asterisk-based telephony systems. It is the latest CounterPath solution for mobile platforms and its first standalone mobile SIP application. Earlier this year, the company launched Linux, Mac and Windows versions of Bria. In addition to the Bria-branded version, CounterPath will also be developing customized white-label versions of Bria iPhone Edition for carriers, OEMs and enterprise customers worldwide. “Bria iPhone Edition leverages the iPhone’s native address book and its embedded Bluetooth technology to provide “a seamless calling experience while on the move,” as the company claims. Apple currently ranks third in smartphone shipments, with 16 percent of all units in the category in Q1 2010, according to several analyst firms. For all handset types – smartphones and feature phones – Apple is No. 6, with more than 8.7 million shipped worldwide in Q1. •	Full SIP compliance, enabling use with any SIP-compliant server and hundreds of ITSPs that currently offer CounterPath-based services. o	Bria iPhone Edition appears as another endpoint to service providers or PBX equipment, enabling fast, cost-effective deployments. •	Call quality that’s superior to circuit-switched wireline and wireless voice, and based on the G.711, G.729 and GSM codecs. •	An intuitive user interface that provides one-touch access to voicemail, call history, speakerphone and other frequently used telephony features such as 4-digit dialing. •	Support for DTMF, which lets users enter numbers to access an auto attendant. •	Bluetooth support, enabling hands-free calling for convenience, as well as safety while driving. •	Multi-call management options, including the ability to switch between, merge and split calls, all in ways that are already familiar to iPhone users so they can start using these features immediately. •	Signaling and call encryption via TLS and SRTP, enabling enterprise-class security. •	Optional customized branding available for enterprises and telephony providers.